The real underwater world has already exercised its independence from the work of Simon Faithfull. REEF was fully working for six days, after which he lost transmission. But there is no going back. The artist did manage to burn and sink a 32-tonne ship. He did manage to salvage nearly a week’s video feed from five cameras. A partial success then. If anyone dives, the ship is in Weymouth Bay. A supporting film reveals there’s already a conger eel living in the wheel house, so watch out. We won’t be seeing that any time soon in the gallery. What we can experience is a cavernous darkness and a resonant tidal throb by which it seems the entire former fishing chapel of Fabrica in Brighton has been sunk for this. A strange cargo of monitors glows with pre-recorded footage. And one has to look up, as if to the surface of the waves, to watch a film of the 32 tonne ship as smoke billows and waters flood in. But despite the temptations of the deep (the temptations to read this piece as a comment on anything from the human condition to the eternal unknowable), we mightn’t go there. So . . . Fabrica, Photoworks, Musée des Beaux Arts (Calais), and FRAC Basse Normandie (Caen) have joined forces to provide a possibly sunken institutional structure. 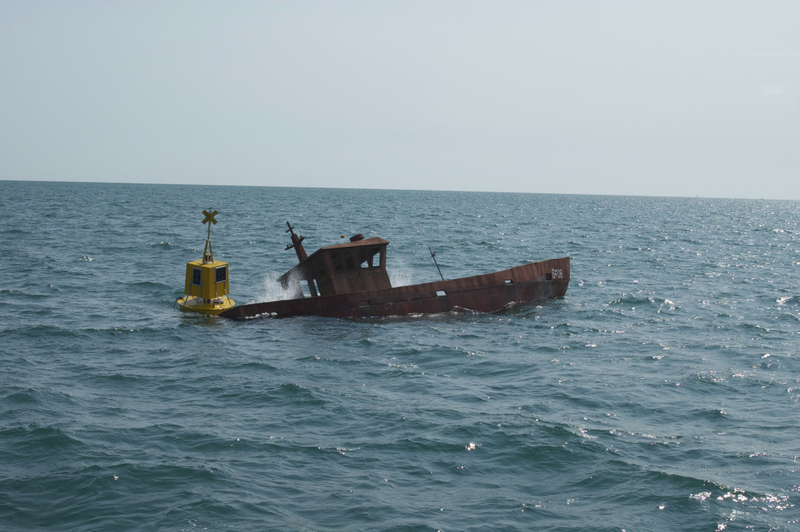 Wreck to Reef, Art AV, Field Broadcast, O’Three, Precision Energetics, Dorset County Council, Weber Industries, Ringstead Caravans and Quest Underwater Services provide the ecosystem. To see so many bodies pulling together to produce an act of conservation, let alone an epic piece of public art, is as inspiring as any number of visits to an aquarium. **cited in Otherworldly, an essay by J Malcolm Shick, in Underwater, published by Towner Gallery in 2010. REEF can be seen at Fabrica, Brighton, until November 23 2014.